1. Too much noise, love pets do not cooperate, afraid to cut hair. 2. Ordinary electric scissors heads are prone to fever, and generally it takes a long time to shave the pets and it is easy to scald pets. 3. 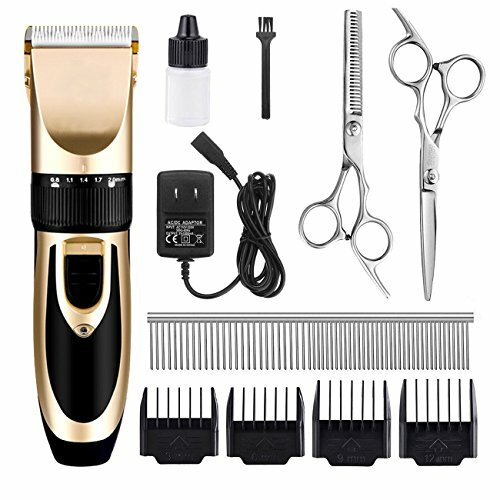 The ordinary electric hair clipper motor has low power, and it is difficult to push down when the pet hair of a relatively heavy hair is shaved, and the hair is easy to clip, and the ideal shaving effect cannot be achieved. ♣ Low Noise - The electric clippers are equipped with a specially designed motor, low vibration and low noise, which can effectively prevent scaring pets. ♣ Powerful - The blade is made of high-strength ceramics, long-term sharp and durable, and equipped with a specially designed motor, powerful without worry about clip hair. ♣ Lasting Battery Life - Wireless and rechargeable design, 5 hours fast full charge sustainable use for 70 minutes, can also be used while charging. 1. A bit of oil can be added to the blade before use to help maintain optimum performance. 2. Please note it is normal that the blade getting hot after working for a period of time. It is better to let the device take a break for 10 mins after working one hour or above. We offer 30 days free replacement and 1 year free warranty of every products.If you have any questions,do feel free to contact us.We will do our best to help you. SUPER QUIET - Pet clippers for dogs with Precision motor, low vibration and ultra quiet design, free it from work noise with only about 60 db, to help the pet feel at ease, not afraid haircut any more. Powerful motor of professional dog clippers (the spindle of which is made of fine copper), not to clamp and hurt pet hair. SHARP BLADE - Cat clippers with Titanium acute-angle blade combining with the ceramic movable blade for smooth and efficient cutting,the fine-tuning knob offers five level of length (0.8-2mm)for precise adjustment on hair length.With 4 attachment guide combs: thinning-out, (3mm/6mm/9mm/12mm,) skin-friendly contour-following combs make it safe, easy, comfortable. CORDLESS DESIGN - Light weight and cordless design for easy use. The pet grooming kit is equipped with a charger. Charging for five hours, pet grooming clippers can sustain uses of 70 minutes. With the cordless clipper, you can no longer be bothered by the trouble of replacing batteries or boring wires.but also available for cord. DURABLE AND EAZY TO CLEAN - The Dog Clippers with ceramic blade sharpness, wear-resistant and not block hair, the service life of ceramic blade is 3 times longer than metal blade. Cleaning is really easy, It just need to use the cleaning brush to clean, If you like, you can also remove the blade for water flushing. GUARANTEE AND WARRANTY - 30 days free replacement and 1 year free warranty of every products.If you have any questions,do feel free to contact us.We will do our best to help you. If you have any questions about this product by DIGDAN, contact us by completing and submitting the form below. If you are looking for a specif part number, please include it with your message.